In this video we are going to look at the 3 secrets to creating engaging videos that keep your viewers watching right to the very end. Video is obviously a visual medium. That is its strength, so use it. That means show, don’t tell. 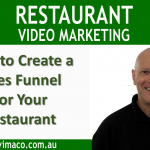 For a simple example instead of you saying your ‘I’m hungry’ you just show them grabbing some chocolate cake and devouring it.That is far more effective than just using your words.So how can we use these visual clues for our videos? If you present yourself as a successful business person offering financial advice, then recording the video in your little bedroom is not going to be congruent with your message. or on a big beautiful yacht in tropical paradise, then that will support your message. Often your audience will not consciously pick up these things,but subconsciously they will feel that things are not right and this will cause mistrust of you.And that’s not a good thing, especially if you want to sell them your stuff. So where you set you video, including what you wear, how you are groomed and everything that you can see in the video frame, is what is called the mise-en-scene.And it is the mise-en-scene that can help you to deliver your message and create trust. So if you are a chiropractor, instead of having to say “I’m a qualified and successful chiropractor, with lot’s a happy clients” , you can record your video in your practice, with your certificates on the wall behind you, and maybe some happy patients waiting to see you. Your audience will believe what they see, more than what you tell them. So think about how you can use visual clues for your message instead of telling your audience. There are two types of audio – your main audio and the background audio. So with your main audio which is when you speak, if your audience cannot hear you, they will not watch you.The secret to having a clear audio is to have the microphone as close as possible to the source of the sound. So with my set up for this video, I am using the iphone 7 plus with this sennheiser lavalier microphone. With my other video camera set up, I use a Rode shot-gun microphone, just out of frame. And it only captures sound that’s in front of it. So the rule is NEVER use internal microphones on your camera devices unless – there are no other choices. If you do use a smartphone’s internal mic, make sure to keep it close to your face. So how can you use this for your marketing videos? Well, often when you are trying to sell your stuff, you need to be able to inspire your audience to want to change their lives, and having the right background music, can really create the right mood for your audience to take action. So must deliver clear audio when you’re speaking and think about using music or even special effects sounds to enhance the audience’s experience. You need to consistently interrupt your audience so that they keep paying attention to your video.This is due to the fact that we are all hard-wired to be aware of changes in our surroundings. So for example our ancestors walking through the jungles, needed to be aware of any movement which could be an animal that was hunting for their lunch. So with a talking head video like this, if you don’t vary your movements, your viewers mind will start to wonder off other things such as what they are going to eat tonight or whatever. And it’s only when you do something different, that grabs their attention again, and they focus back on you. So if you naturally present with a minimal amount of movement, then every now and then, make some sudden movements that makes sense to what you are talking about. And if you naturally tend to move a lot, then be still every now and then. You can also vary the speed of your vocal delivery as well as the volume. And don’t forget to pause, every now and then. You can also create interruptus when you’re editing your videos and alternate your shots from medium to close up by zooming your video. You can also use my little secret of the second camera by cutting to a shot on the side and by pretending I’m presenting to main camera and making it look like I have a second camera. So breaking your video with interruptus will help keep your viewers’ attention right until the end of your video. You know, the biggest surprise I get when I ask the business owner, what is the objective for their video and I get some sort of a vague answer, like ‘I want get as many views as possible’. No wonder their videos don’t give them a ROI. You have to start with a clearly defined objective, whether it is to build a custom audience, subscribe to your channel, grow your mailing list, register for you webinar or even buy your stuff. This is your Call to Action and the purpose of your entire video is to get your viewers to take your desired action. Full stop. Too many times I see a CTA that’s been added to the end of the video as an afterthought and that’s why it doesn’t work. So be clear what you want your audience to do and the tell them exactly how to do. It’s that’s simple.. Once we know the desired outcome, we need to specify the target audience that will help you to achieve our objective. Now imagine scrolling down your Facebook newsfeed and you have all of these videos screaming out “Hey Everybody” – but then, you have one video that calls out your actual name. You going to stop to watch this video because it was made just for you. Obviously we can’t actually do that with our videos, and it would be kind of creepy if we could, but that is exactly the effect you want to create for your call out. So instead of calling out their name, we need to call out something specific that will capture their attention and we can do that by focusing on their pain point. “Are you struggling everyday with chronic lower back pain?” Obviously anyone without lower back pain will simply ignore your video – and that’s okay. Because those who do have that specific problem, they will want to watch the video. And that means your conversation rate will increase. Your content is the meat in the sandwich. I believe that you should always give away your best stuff. Your audience will judge you on your content, so make sure it give them good value that helps them. But before you do that, your audience have to understand the WHY? Why do they need to watch your content. Focus on the benefits they will get. Show them the journey that you will take them from where they are now, with their pain, and where they will go – without the pain. “You can get permanent relief of pain, without surgery on your lower back by simply by doing these specific exercises everyday”. Once your audience understands the why they need to watch your content, then they will be more likely to not only to watch it, and more importantly – take action.If they don’t take action, then they will not buy your stuff. Always give your audience a quick win. That is, give them a tip that will help them straight away. This will give them proof that you can actually help them. So the chiropractor can show them a simple exercise that will give them instant relief from pain. It might only be temporary, but it will show them that he knows their stuff. And that creates the vital trust factor. Visual Clues, Clear Audio, using Interruptus to maintain our viewer’s attention. We also looked at the actual content of the video and being focused on our objective. We start with the end in mind with our Call to Action, and build the video around the CTA. We then Specify our Audience by calling them out right from the very start. We give them the WHY they need to watch our content and finally, give them a gold nugget to prove that you can actually help them. If you focus on these 7 key secrets for your videos, you will attract your ideal audience, keep them watching till the very end and then take the action that your desire and increase your conversion rate. So thank you for watching this video, I hope you found it useful.